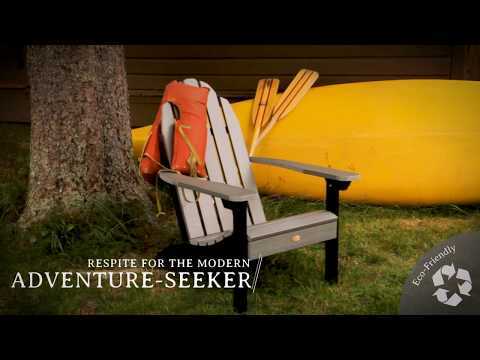 The ELK OUTDOORS® Eco-Friendly Essential Adirondack Chair is responsibly designed for adventurous souls seeking respite in today’s busy world. Its classic, yet comfortable design encourages you to shed your digital skin and relax as you take in the world around you. The Essential Adirondack Chair is just that, essential. It doesn’t matter if it’s in your cabin or the backyard of your parents’ house, this is YOUR chair. Wherever you go, your ELK OUTDOORS® product will follow you through life and be there when you need that comfortable haven. The chair has been load-tested, per ASTM 1561-03 (2008) standards for Outdoor plastic furniture, and has a 500-pound weight capacity. Some assembly is required (don’t worry, there is an assembly guide) and assembled dimensions = 30"W x 40"H x 34"D (35lbs). Love this chair! So far it is holding up great in our backyard surrounding our firepit! The material is much more heavy-duty than i expected. Can't wait to purchase more. This is the perfect chair! I was searching for an all weather chair that wouldn't break the bank. Best of all, this product is American made! Couldn't be happier with this purchase.